Bikesafe is an initiative run by An Garda Síochána that aims to reduce the number of motorcycle casualties. By assessing (free of charge) your riding skills and passing on their knowledge, skills and experience, advanced Garda motorcyclists can help you to become a safer and more competent rider. Sergeant Nigel O’Neill, Ardee Garda Station, is currently seeking expressions of interest from riders with a view to establishing a BikeSafe initiative in the North East region. BikeSafe in Ireland is a purely voluntary effort by individual members of An Garda Síochána who give freely of their time and expertise for the benefit of all riders. We in MAG Ireland wholly endorse this effort, and we strongly encourage all riders regardless of age or experience to participate in and support this initiative. 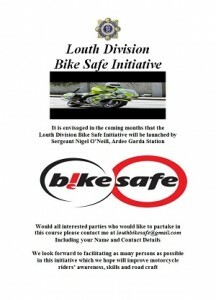 If you’re interested in taking part, please e-mail louthbikesafe@gmail.com with your name and contact details. You can help to spread the word by downloading the poster below and displaying it in your workplace or club.